This 18 AWG 2 conductor fire alarm cable comes on an easy-to-use 1000 ft. wooden spool. The cable is composed of two 18 AWG wires inside of a FPLR rated jacket and shielded with an aluminum foil barrier. Shielded cables are preferred to protect sensitive equipment from EMI interference. 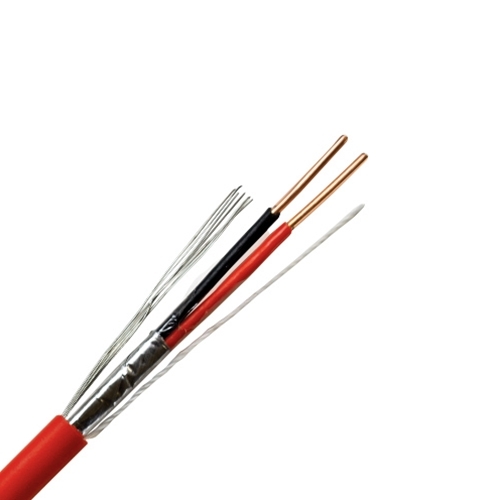 This fire alarm cable has a red jacket and is approved for 300 volts with a temperature range of -10°C to 75°C. Our fire alarm cables are FPLR and meet UL 1666, which are perfect for commercial installation in vertical floor-to-floor runs, where the length exceeds one story. For more details on NEC riser rated guidelines, please reference section 760-154(B) of the National Electrical Code ANSI/NFPA 70.